The computer labs on Háskólatorg 204 and Stakkahlíð have a multifunctional printer (serves both as a printer and scanner) and the computer lab in Árnagarður has a color printer as well. Notice! the price for printing one piece of paper in color is 5 credits (35 ikr.) and for black/white print is 1 credits (7 ikr.). The printer works in fact like two printers with different names where the black and white one is called ht-2vprint00 and the other one is called Litaprentun / Color Printing. The black/white is automatically selected on the computers in the lab. 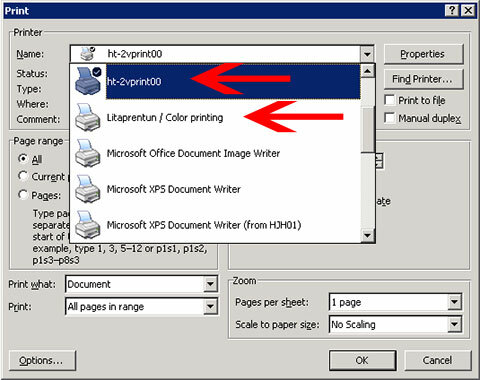 When you select “Print” in any program, a window like the one below appears where you can choose whether to print in black/white or color. Note! 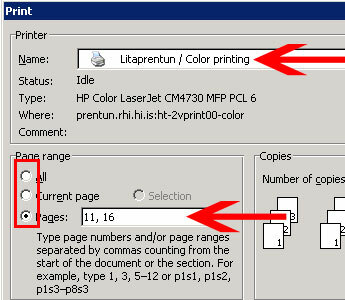 if you intend to print more than one page and a part of them are in color and the rest is in black/white then it is best to print the document in two parts. This way you don’t have to pay a color price on pages which only contains normal text. 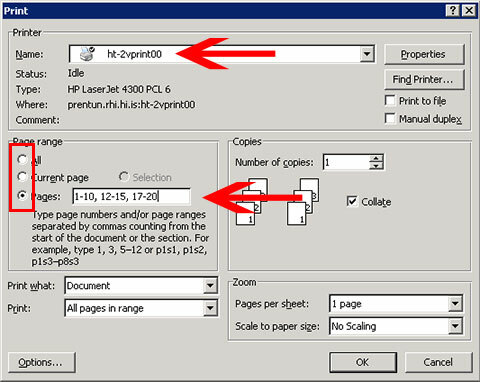 Below you can see an example on how to print a document where all the pages are black/white except for page 11 and 16.